He showed true leadership. Other executives should try to be more like him. It has been a bad week for President Trump . On Wednesday afternoon, Trump announced his decision to dissolve his two business councils, the Manufacturing Jobs Initiative and the Strategy and Policy Forum. These two highly touted groups had assembled corporate and labor leaders from across the country to advise the White House on matters relating to job growth and the economy, although they had yet to hold formal meetings. 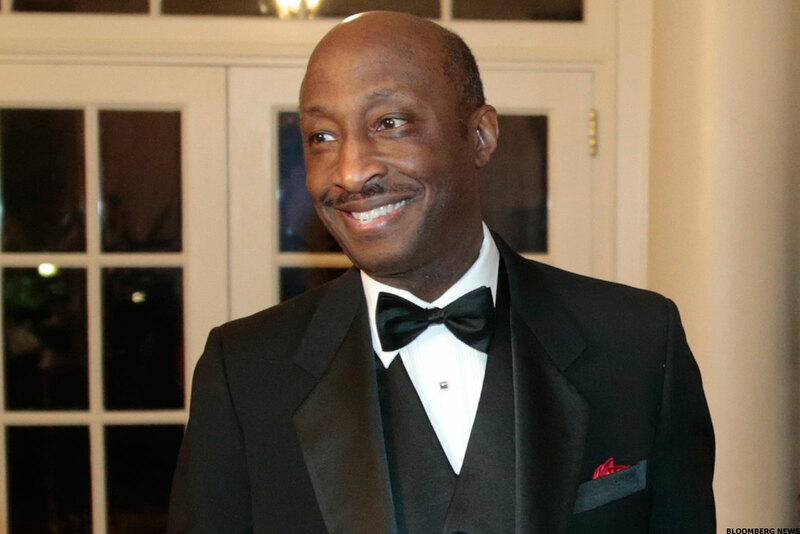 The councils began to dissolve after the events of Charlottesville last weekend when Merck (MRK - Get Report) CEO Kenneth Frazier resigned in protest over Trump's failure to condemn the white supremacists and neo-Nazi marchers. In a statement, Frazier said that his resignation was "a matter of personal conscience" and "a stand against intolerance and extremism." Frazier's resignation sparked several other CEOs to follow. After Trump's comments on Tuesday, which once again placed left-wing protestors on equal footing with right wing hate groups such as Stormfront and the Ku Klux Klan, executives on both councils discussed mass resignation. Trump dissolved both groups on Wednesday afternoon to stay ahead of this. Those resignations were coming, because Trump's comments made this a question of leadership. "What prompted those CEO's quitting the councils was the absence of firm, specific declarations from Trump that the U.S. will not tolerate violence and hatred from white supremacists, today or in the future," said Chris Edmonds, an executive consultant and author of The Culture Engine. "These CEOs may not have had the responsibility to quit but they had a moral obligation to make a stand against that violence - and against Trump being so wishy-washy." While America has grown more deeply divided on most major issues, most adults agree that Nazis, white supremacists and Klansmen violate the country's basic moral code. Overt racism, at least, was long supposed to have been a settled issue. Even among some of Trump's supporters (but not all) those excuses fell thin on Tuesday when Trump reiterated, in a series of extemporaneous remarks, his opinion that left wing protestors were equally responsible for the violence in Charlottesville. With that statement he transformed a political issue into a moral one, showing sympathy for and aligning himself with people who explicitly marched under Nazi and Confederate flags and who led a parade chanting "Jews will not replace us." When Frazier abandoned Trump's business council on Monday, it was the only decision left to a man of conscience. The issue had become so unambiguous that staying with Trump meant allying himself, and by extension his company, with an administration that had openly sympathized with white supremacists. "Effective leaders take strong stands when it comes to human rights, fairness, and justice," Edmonds said of the CEOs who began defecting from the business councils. "These were effective leaders acting from their own values, from their company's values, and from the values set forth in our Constitution." Being bold and demonstrating conviction are two necessary tenets of leadership. "The message they were sending?" Edmonds added. "'This is more important than you think, Mr. President - more important than their opportunity to rub shoulders with you. You, sir, were wrong in not specifically denigrating white supremacy, hatred, and violence. By not doing so, you tacitly approve of that violence.'" Frazier deserves credit for his decision to resign on Monday. Trump's initial statement on Saturday, blaming "hatred on all sides," showed his values far more authentically than the written remarks he gave on Monday, and Frazier showed his in being the first executive to stand up and say that he would not serve with an administration that sympathizes with hatred, violence, and Nazi ideology. Moreover, his fellow CEOs and he had an obligation to act. By staying on Trump's business councils they not only would have allied themselves with this administration, they would have entangled their companies' names and reputations as well. As executives with a duty to employees and shareholders alike they had a responsibility to make sure that their businesses did not become similarly tied to a message of self-proclaimed hate. As Edmonds said, they may not have had a responsibility to specifically quit, but they had an obligation to act. Businesses don't always have the luxury of picking political sides. However an executive votes in November, they still need to work with the government in office. That's just life, and it's true almost all of the time. PepsiCo (PEP - Get Report) doesn't owe abortion advocates an apology for CEO Indra Nooyi's decision to join Trump's business council in the first place. Every now and again, however, an issue becomes so stark that no one can avoid responsibility. White supremacists marching under the Nazi banner make just such a case. Trump chose to use the White House to declare that their movement isn't all bad. Leaders like Frazier lived up to their obligation to tell him that yes, it is. Does political talk in the office bother you? We asked some good samaritans around Battery Park how they deal with it.